Where to Buy Conquer Insecticide, Conquer EC Long Lasting Insecticide - Pt - $25.55 for Sale with Fast Free Shipping! Conquer EC Long Lasting Insecticide - Pt has been the pest management industry's leading general use pesticide of its kind. It's very broad label, multiple application sites and variety of application techniques make Conquer an unparalleled choice for today's PMP. There is only one Conquer, and it is everything you ever wanted in a general-use pesticide. 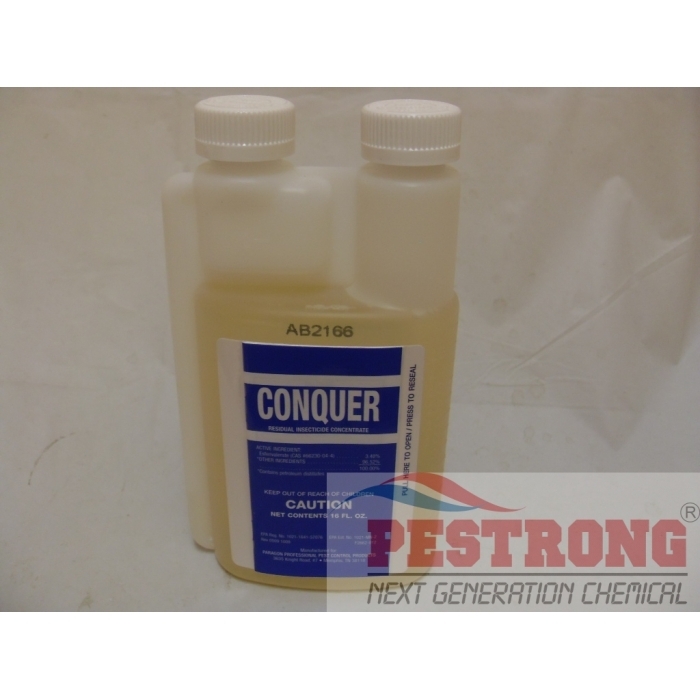 GENERAL: Use CONQUER Residual Insecticide Concentrate to control the pests indicated in the listed areas as a contract spray by mixing either one (1) or two (2) fluid ounces of concentrate in one (1) gallon of water or oil and mix thoroughly before use. One (1) ounce of concentrate per gallon of water or oil will make a spray containing .027% active ingredient, two (2) ounces per gallon will make a spray containing .05% active ingredient. For initial clean out of heavy infestations use two (2) ounces of concentrate per gallon of spay; for maintenance control or light infestations use one (1) ounce concentrate per gallon. When using oil as the diluent, an odorless light petroleum hydrocarbon as defined by CFR Title 21, sec. 172.884 should be used for all food area and food related applications. For all applications of contact sprays use at the rate of one (1) gallon (diluted spray) per 1,000 square feet of surface area. Application Only Within Food and Non-Food areas of Food Service and Handling Establishment (Places Other Than Private Residences) including, But Not Limited To: Restaurants, Grocery Stores, Bakeries, Food Manufacturing and Processing Establishments, and Food Warehousing Establishments. Do not treat establishments where livestock feed is present. Food areas include areas for receiving storage, packing, canning, bottling, wrapping, boxing, preparing, edible waste storage and enclosed processing systems, mills and dairies. Serving areas are places where prepared foods are served, such as dining rooms, but excluding areas where foods may be prepared or held. Non-food areas include garbage rooms, lavatories, floor drains to sewers, entries and vestibules, offices, locker rooms, machine rooms, boiler rooms, garages, mop closets and storage after canning or bottling. To kill the accessible Stages of Granary Insects: Rice Weevils, Confused Flour Beetles, Rust Red Flour Beetles, Saw-Tooth Grain Beetles, Cadelles, Meal Moth Larvae and Adults, Cigarette Beetles, Drugstore Beetles, and Granary Weevils: Apply as a coarse wet spray to surfaces where these pets are normally found,such as floors, baseboards, around walls, benches, and pieces of equipment. Use at a dosage of one (1) gallon of spray per 1,000 square feet. Pay particular attention to cracks, crevices,and similar protected locations in floors and walls. Spray thoroughly around and into floor drains, non-food conveyors, and other areas where other granary insects may be found. Do not apply when food processing facility is in operation or foods are exposed. Do not apply this spray to surfaces or utensils that may come into contact with food; excess residues in food may result. Repeat Application as Needed, but Do Not Exceed More Than One Application Every Fourteen (14) Days. every seven (7) days restaurants and similar food service establishments or more than one application in every fourteen (14) days in all types of food handling establishments. particles of aerosol size thirty (30 microns, or less). Direct spray first into all cracks and crevices, behind all equipment, appliances, cupboards, or any dark harborage areas, then treat as a space spray directing the spray towards the ceiling and upper corners of the room at the rate of one (1) ounce (diluted spray) per 1,000 cubic feet of space. Do not remain in treated area. Keep area closed for at least 1/2 hour and ventilate thoroughly before re-entry. Do not repeat application more than once every three (3) days. To Kill The Adult And Accessible Forms Of Insect Pests Of Stored Food (Stored In Multi-Walled Paper Bags Or In Cloth Bags) In Warehouses, Storage Rooms And Similar Locations: Infested stored products should be removed and destroyed, fumigated or treated with other products approved for this use. Use as a above in mechanical aerosol foggers at the rate of one (1) ounce per 1,000 cubic feet of space. Keep area closed for at least 1/2 hour. Do not remain in treated area and ventilate through before re-entry. Do not repeat application more than once every three (3) days. Rice Weevil, Yellow Meal Worm, Cadelle, Confused Flour Beetle, Saw-Toothed Grain Beetles, Angoumeis Grain Moth, Mediterranean Flour Moth, Indian Meal Moth, Cigarette Beetle, Grain Mites and Cockroaches. Do not apply when food processing facility is in operation or foods ore exposed. Do not apply this spray to surfaces or utensils that may come in contact with food. Food contact surfaces and equipment should be thorough y cleaned with an effective cleaning compound and rinsed with potable water before using. Application Within Residential and Non-Residential Buildings including Homes, Apartment Buildings, Kennels, and Non-Food Areas of Industrial, Institutional, and Commercial Buildings,such as Hospitals, Warehouses, Truck Trailers, Railroad Cars, Theaters, Office Buildings, and Schools. General: Apply as a course wet spray to thoroughly treat hiding places such as cracks, crevices, and moist areas around pipes, under refrigerators and along baseboards to control pests listed below. Use at the rote of one (1) gallon of spray mixture per 1,000 square feet. Spray directly on insects when possible. Do not permit humans or pets to contact treated surfaces until spray has dried. Repeat as necessary. Do not treat establishments where livestock feed is present. around doors and windows wherever these pests may find an entrance. Repeat as necessary. apply a fine particle broadcast spray, using the one (1) ounce per gallon of water dilution to infested rugs, carpets, and pet resting areas. Prior to treatment, aquariums and fish bowls should be covered and birds, such as canaries, removed from the area. Do not permit humans or pets to contact surfaces until the spray has dried. Old bedding should be removed and replaced with clean, fresh bedding after treatment. Do not Spray Pets with this product. Treat dogs and cats with a product registered for use on animals. To Kill Carpenter Ants: Apply two (2) ounces per one (1) gallon of water as a coarse spray, around doors, door frames, windows and other areas where these ants enter the premises or hide. Spray into cracks & crevices, through openings or small newly drilled holes into wall voids where these ants or their nests are present. GENERAL: Use CONQUER Residual Insecticide Concentrate at the rate of two (2) fluid ounces per one (1) gallon of water to control on contact cockroaches, ants, crickets, sowbugs, spiders and ticks. Use at the rate of one (1) gallon per 1,000 square feet to outside surfaces of buildings, porches, patios, garages and other areas where these pests have been seen or found. Do not spray near fish ponds or other bodies of water. Avoid soaking young or flowering plants. Building Perimeter Treatment: To help prevent infestation of buildings by ants, crickets, spiders, centipedes, and sowbugs (pillbugsj, treat a 12-18 inch band of soil or other substrate adjacent to building foundation to a height of 2 to 3 feet where these pests are active and may find entrance. Use two (2) fluid ounces of concentrate per gallon of water and apply as a coarse wet spray at the rate of one (1) gallon per 1,000 square feet. termites are seen emerging from wood piles, wooden fence posts, wooden structures, or from the ground. Swarming usually occurs during the spring or at other times when a termite colony becomes over crowded and new reproductive termites with wings emerge and fly away to mate and establish new colonies. This treatment will control the sprayed termites and will not protect the structure from which the swarm is coming. Use only a contact spray to kill emerging reproductive (winged) and worker termites emerging from infested wood. TO KILL WOOD DESTROYING PESTS: OUTDOORS ONLY: Carpenter Bees, Carpenter Ants, Old House Borers, Powder Post Beetles, Furniture Beetles, Round-Headed House Borers, Deathwatch Beetles. Use two (2) fluid ounces of concentrate per gallon of water and apply as a coarse, wetting spray to exposed pests, and to damaged areas of wood, spraying into galleries or tunnels in the exposed wood. Also spray around doors, door frames, windows and other areas where these pests may enter the house or hide. Spray into cracks and crevices and, if necessary, drill small holes and spray into inaccessible wooden structural void where these pests are suspected. or two before spraying. Spray using a slow, even sweeping motion, being sure to cover the entire lawn surface where the pests will normally frequent. Spray under ornamentals and trees, but avoid soaking young or flowering plants. Repeat treatments may be necessary at 7 to 14 day intervals. Kills on contact the Ixodes dammini tick (deer tick), which transmits lyme disease. Also kils foraging fire ats upon direct contact. A registered fire ant mound treatment should also be used in conjunction with this product. Keep pets and children out of the treatment area until after spray has dried. Do not spray animals. Dogs, cats, their kennels or bedding area should be treated with a registered flea control product in conjunction with this application. To control outdoor Infestations of Asian cockroaches: Dilute 10 teaspoons of CONQUER Residual insecticide Concentrate in 30 gallons of water to treat 5,000 sq. ft. Repeat as needed. Keep children and pets off treated areas for 24 hours or until the grass has completely dried. It works! Heard about Conquer, ordered and used it, I am now 2 weeks out with NO fleas! I am ready to do my 2nd application. I recommend this product!